Corpus Christi Business News continues to report daily economic news from the Coastal Bend at CCBizNews.com, where readers will also find interactive ads from the Corpus Christi Business Directory, also known as The Blue Book Phone Book. After January’s issue, Corpus Christi Business News will become an online-only newspaper. Delivery is still available but to your email inbox rather than your mailbox. Sign up at CCBizNews.com/newsblast for a weekly email that will keep you in touch with economic factors affecting the Coastal Bend. You can also follow Corpus Christi Business News on Facebook and Twitter, where your feedback is encouraged and always welcome. The change coincides with the publication of the new Corpus Christi Business Directory. Together, Corpus Christi Business News and the directory create a vibrant, interactive website with information about local businesses and services unmatched anywhere in the Coastal Bend, or even the nation. Texas Publishing is the parent company for both publications and 101 Corpus Christi Living magazine. A monthly events-driven direct-mail magazine, Corpus Christi Living will also go online after its current print edition. It partners with 101 Fun Things to do in Corpus Christi, the area’s most complete and comprehensive interactive vacation website at 101CorpusChristi.com. The 2019 edition of the local Corpus Christi phone book, which is affectionately known as the Blue Book, remains a family-owned publication. The interactive website that backs up the book, creating an interactive, mobile online presence for each and every one of its advertisers, was the vision of the late Dan Alvey, who died Dec. 17, 2018, due to complications from a boating accident in Tacoma, Washington. The company, which has been under the management of Alvey’s daughter, Amber Weems, and his wife of 45 years, Lee Alvey, will continue to serve the Corpus Christi community, Weems said. 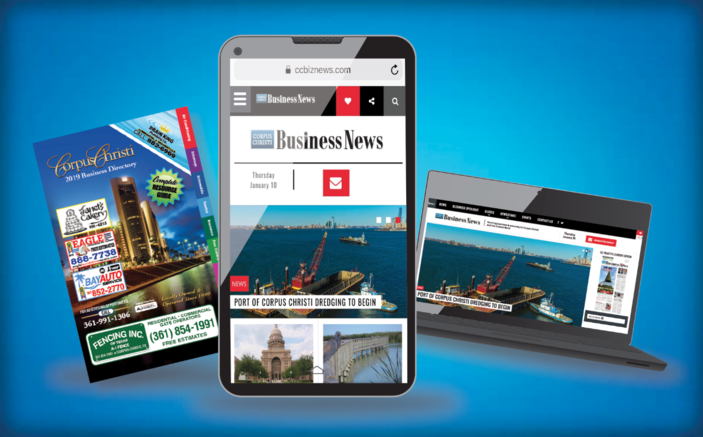 Advertisers in the 2019 Corpus Christi Business Directory have digital ads on CCBizNews.com that can be accessed on computers, tablets, and smartphones. While all three are interactive, the mobile version puts the entire phone book in the palm of your hand, giving you the ability to touch a phone number to make a call or an address for instant directions. You can also instantly go to company websites or build a list of favorites for price and service comparisons. Additionally, advertisers are sorted into categories, just as they are in the phone book, for easy searches. Along with the company information, each section, or guide, includes engaging editorial content that brings online traffic to the advertising page, generating even more business opportunities for everyone. To advertise in the 2020 edition of Corpus Christi Business Directory, call Hotchkin at (361) 991-1306. Once you have signed a contract for the next print edition, your ad goes online, extending your message beyond the printed page in a way that engages your audience.